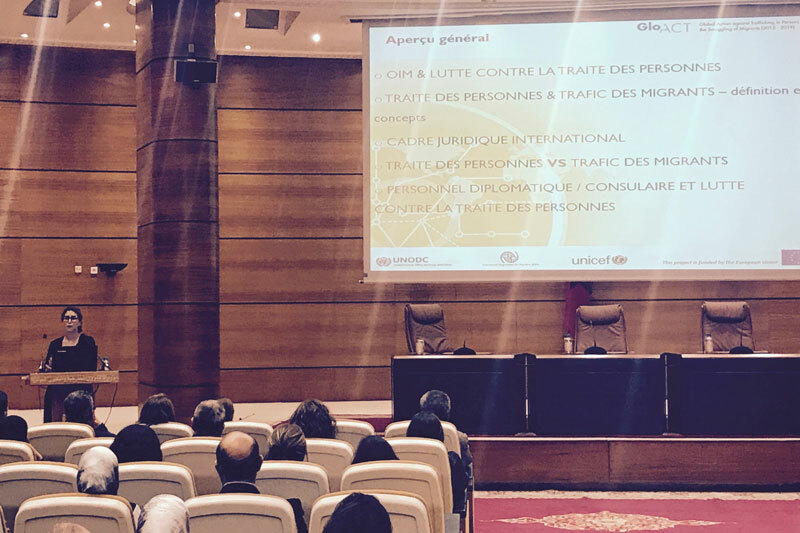 Morroco - In coordination with the Ministry of Foreign Affairs and International Cooperation of the Kingdom of Morocco, the International Organization for Migration (IOM), one of GLO.ACT three implementing organizations facilitated, on 3 July 2017, a first information session on Trafficking in Persons (TIP) and Smuggling of Migrants (SOM) for diplomatic and consular personnel eligible for job transfers. The aim of the session was to address international and national legal frameworks related to TIP and SOM as well as the protection and assistance to victims of trafficking and smuggling. The session proved to be an excellent awareness-raising forum for over more than 100 participants. It allowed eligible diplomatic and consular personnel to gain insights into the crucial role they can play in the fight against TIP and SOM. Moreover, the session equipped participants with the operational means and best practices to better address and fight these crimes. This information session took place in the context of the Global Action to Prevent and Address Trafficking in Persons and the Smuggling of Migrants (GLO.ACT) is a four-year (2015-2019), €11 million joint initiative by the European Union and the United Nations Office on Drugs and Crime (UNODC). The project is being implemented in partnership with the International Organization for Migration (IOM) and the United Nations Children's Fund (UNICEF) and reaches thirteen countries across Africa, Asia, Eastern Europe and Latin America. GLO.ACT works with the 13 countries to plan and implement strategic national counter-trafficking and counter smuggling efforts through a prevention, protection, prosecution, and partnerships approach.